No weapon formed against you shall prosper, And every tongue which rises against you in judgment. You shall condemn. This is the heritage of the servants of the Lord, And their righteousness is from Me," Says the Lord. So I hear Mercy and Grace playing, they are tossing a toy back and forth. I have their cage in my bedroom and they have many toys to choose from. I'm in and out of sleep but at one point I heard one of them hiss. Hmmm....this game is getting serious! I dose off again. Sometime later I am awakened again and these cats are still making a ruckus. See they have a favorite toy that squeaks and they can play for hours....but the rule is "No Playing at Night when Mom is Sleeping". So, I decided to get up and put away this toy so they would let me sleep (they have clearly broken the rule). Sometimes the enemy of our soul places himself in very perilous situations. Let me explain. As I looked closer what I thought was a toy of entertainment for my kitties turned out to be a little "living" mouse. Now, once I got over the "yukkie" part, I woke up my husband and set "get rid of it". So, my wonderful Superhero Husband exterminated the cause of the squeak. Ok, gross story, funny story...but here is my other thought. Of all the places this little mouse could have roamed, it chose my bedroom; a room with locked doors and not one or two, but three wonderful "lions" :) He did not have a chance; no place to hide; no opportunity of escape. He entered the wrong house, the wrong room! I learn from life experiences and I see every day as an opportunity to see the Word of God come to life. The Bible reminds us to be alert and of sober mind. We have an enemy the devil...he is looking for someone to devour, to throw off, to manipulate, to distract.... 1 Peter 5:8. He schemes and devices situations meant for our demise. He tries to instill fear, doubt, and promises defeat when God clearly is for me! Recognize, identify what has entered your space; your room, your heart, your thoughts. 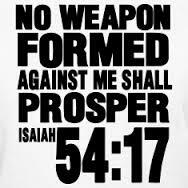 No weapon formed against us will prosper. Speak to that which crawls on its belly; every opposing spirit that tries to disrupt the Peace that our God promises! We belong to Jesus, a people purchased by his blood. It's not because of our own righteousness but because of Christ's righteousness that we can stand! Satan, "YOU CHOSE THE WRONG ROOM TO ENTER". It turned out Mercy, Grace & Savannah Hope had not broken the "rule". Actually they were insuring me of further good sleep without the danger of an "intruder".